With its drab two-tone walls, neon lighting and plastic chairs, it looks more like a lecture hall than a war room. But instead of students, officers from Iraq's security forces study a bank of flat-screen TVs showing feeds from drones flying hundreds of miles away. On one side, amid a jumble of equipment, sit a row of U.S. servicemen. They tap occasional directions to the drones on their laptops while eating lunch, Iraqi-style ribs with rice, from Styrofoam boxes. One computer, left alone for a minute, loops a video of penguins frolicking on an ice floe. The languid atmosphere in the Joint Operations Center, here on the historic plains of northern Iraq, is deceptive. For months, they have been preparing for what could be a turning point in the fight against Islamic State and its 2-year-old, self-proclaimed caliphate in Syria and Iraq: the campaign to retake Mosul. Expected to commence in the coming weeks, the battle for the city of 1.2 million people, Iraq's second-largest, is expected to send up to 1 million people fleeing for safety and help determine the future of America's bid to contain the spread of violent Muslim extremism in the Middle East. "Where is the existential threat to Iraq?" Maj. Gen. Gary J. Volesky, commander of the U.S.-led coalition's ground forces in the country, said recently as final preparations were getting underway. 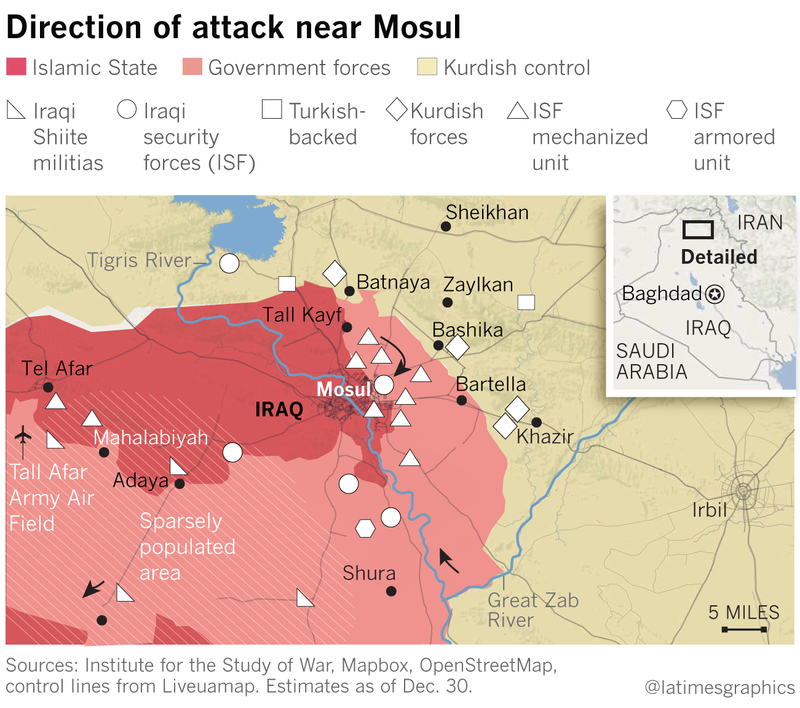 "The decisive point for the fight in Iraq is Mosul." It was more than two years ago that Islamic State blazed through Mosul, capturing a city that was then home to up to 2.5 million people — part of a blitz that soon put the militant group in control of a third of Iraq and Syria. Iraq's army, which had collapsed in the path of the jihadis, has been waging a slow fight to recover. Backed by the warplanes of the U.S.-led coalition and tens of thousands of paramilitary fighters — some of them supported by Iran — Iraqi troops this year have wrested control of some of Islamic State's major bastions, shrinking the group's territory by a quarter of what it controlled in 2015, according to a July report by IHS Conflict Monitor. Yet nothing they have done so far compares with the upcoming battle for Mosul, a crossroads of commerce and culture for thousands of years that is the jewel in Islamic State's crown. Its size alone has made the task of overrunning it a daunting one. The Iraqi army will have to throw everything it has into the campaign, military commanders say, but there is now a conviction that there is no more time to wait. "The momentum is with the Iraqis, and they know it," said Col. Brett Sylvia, head of the U.S. Task Force Strike in Iraq. "Previous commanders would say to their troops, 'This year we're going to Mosul,' and they didn't go. When we came, they told us we weren't going to Mosul. But we will." One of the big uncertainties is how much support Islamic State militants have among the city's inhabitants. When Islamic State militants first swarmed into the city in June 2014, the primarily Sunni Muslim residents, nurturing longstanding resentments against Iraq's majority Shiite Muslim government, hailed the jihadis as liberators. The militants rolled into the city on pickups flying the group's trademark black-and-white banner, then quickly appropriated the U.S.-supplied Humvees and armored vehicles left by the fleeing Iraqi army. The takeover stunned Iraqis and humiliated the government, but it also granted legitimacy to Islamic State's vision of a self-declared caliphate in the eyes of some Muslims, especially when the group removed the much-hated borders, imposed by Britain and France at the turn of the last century, between Iraq and Syria. The Mosul takeover cleared the way for Abu Bakr Baghdadi, Islamic State's leader, to make his first public appearance, delivering a sermon at Mosul's Great Mosque in which he declared himself caliph of the militant group's emerging empire. Immediately after Mosul's fall, jubilant activists posted photos of volunteers cleaning the streets and removing concrete barriers. They called the takeover a revolution and praised the militants for their courteous and welcoming behavior when speaking to journalists they encountered outside the city. But matters soon took a turn for the worse. Islamic State fighters banned any other group from raising its flag in the city and confiscated all weapons, pursuing and killing all who stood in their way. Contact with members of factions, on phone or social media, soon went dead. Since then, reports have emerged of severe shortages of food and water, with citizens treated as de facto prisoners. They contradict Islamic State propaganda materials depicting markets overflowing with produce and crowded with shoppers. On a recent nocturnal flyover of Mosul, the city's lights glowed brightly despite talk of electricity cuts. Meanwhile, communications have been all but severed, leaving unknown the fate of a city once famed for its educated and intellectual class. Publicly, representatives of the different forces have put a timeline of between mid-October and mid-December for the start of the operation. In the run-up to the offensive, a 9-square-mile base near the town of Qayyarah, 40 miles south of Mosul's center, is an essential component. Its capture from Islamic State, so soon after the successful recapture of Fallujah, surprised the attack's planners. "People thought [the Iraqis] weren't going to get to Qayyarah until November. They did it in July," said Volesky. Once named after former Iraqi President Saddam Hussein, but now known as Q-West, the base has undergone a major overhaul ahead of the push into Nineveh province, of which Mosul is the capital. It has become the new forward position for government and coalition forces, including the bulk of the 560 U.S. troops dispatched to Iraq by the Pentagon in July. "When we first got there it was like a Category 5 level hurricane went in there and tore through the place. Daesh went through some significant effort and energy to make the ground as unusable as possible," said Sylvia, using an Arabic acronym for Islamic State. But within weeks the facility was operational. On a wall map of northern Iraq in Sylvia's briefing room, someone had drawn concentric circles with a felt-tip pen, with Q-West as the center; they indicated the range of weapons now stationed at the base. Iraqi troops have already begun massing there. Last week, as scores of soldiers and militiamen began an attack on the Islamic State-held city of Sharqat, clumps of army recruits trudged on the nearby highway, pleading for a ride to the air base. The coalition is ramping up its presence as well, with the addition of 600 more U.S. troops, the Pentagon announced Wednesday. Meanwhile, large convoys of coalition trucks and armored vehicles shuttle between Q-West and Camp Swift, a base in Makhmour, a roughly 90-minute drive from the northern Iraqi town of Irbil. In the meantime, most indications point to a zero hour sometime in the middle of this month. Turkish President Recep Tayyip Erdogan, speaking to U.S.-based Turkish community members on Sept. 25, gave Oct. 19 as the kickoff date. British Tornadoes and Typhoon fighter jets have focused their efforts on targets outside Mosul, while Pentagon spokesman Col. John Dorrian said last week that 13 Islamic State commanders, part of the group's military intelligence network in Mosul, had been killed in the last 30 days. Plans for the capture of the city, which is bisected by the Tigris River, call for some forces to advance up to Mosul from the east while army units and special forces, known as the "Golden Division," mount an attack from the south. It's unclear how long the jihadis can last. Although they have had more than two years to prepare against the onslaught, coalition officials say the group's top leaders have already begun their escape. But there are fissures among the ground forces involved in the battle. Some Iraqi militia and intelligence officials have said they suspect the Kurdish fighting forces, also known peshmerga, will try to engage in a land grab in an attempt to join parts of Nineveh province to a presumptive Kurdish state. The presence of the Turkish army in the area, over the objections of the Iraqi government, has added to the confusion. The Turks have provided training and weapons to a Sunni militia led by former Mosul Gov. Atheel Nujaifi. Although the militia intends to join the battle against Islamic State, some of the allied factions view it as an enemy. The U.S., meanwhile, does not want to include the Shiite-dominated factions known as the Popular Mobilization Units, which are accused by the coalition of committing sectarian-driven crimes against Sunni populations in the areas under their control. These concerns have dictated a plan in which both the peshmerga and the Popular Mobilization Units would stay outside the city while the army and special forces engage in street fighting inside Mosul. Nevertheless, officials play down any hint of a fractious relationship. "There is unprecedented coordination between the Iraqi army and the peshmerga. In their battles we help them. And we get calls from their commanders telling us they're ready to help us," said Maj. Gen. Najim Jabouri, the Iraqi army commander slated to lead the attack on Mosul..
U.S. forces will not be on the front line, said Volesky, who described a crucial but behind-the-scenes role for soldiers under his command. "What is different about this fight is that the Iraqis are really in the lead. They're the ones fighting. We're not telling them what to do." At Al Asad base, 180 miles south of Mosul in Anbar province, mobile artillery units stand ready to lob their ordnance at Mosul. A nearby hangar houses more than a dozen drones used to monitor and strike Islamic State targets. At another corner of the sprawling base, coalition trainers prepare 8,500 Iraqi border guards to seal the border to prevent the militants from fleeing back into Syria or Turkey. Over in Makhmour, Camp Swift provides a more literal example of the United States' central role: Nestled between two other bases, it is the link binding the Iraqi army's Nineveh Operations Command to the Kurdish peshmerga. "We have great aerial support from them," Jabouri said of the American presence. "They're like a skillful surgeon removing a cancer." He added that he expected residents of Mosul will be ready to rise up against a much-weakened Islamic State. "In other liberated areas, when we've talked to people who welcomed Daesh in the past, they all said they regretted it. And in Qayyarah, the fight was much easier because the people helped," he said. "We know many people are waiting for their hour of liberation." Bulos is a special correspondent. Follow him on Twitter.